...but I can get Luxus now. And for a lot less. Much as I appreciate Paolo's efforts to bring Luxrender to DAZStudio users (without which Luxus might not exist), I haven't used Reality since the update that added the extra registration requiring personal data. Although I doubt I'll get to play around with it till next weekend, I'm very much looking forward to trying this. Thread title changed to more facilitate a general discussion on the new plugin. I made the quickest render I could throw together. 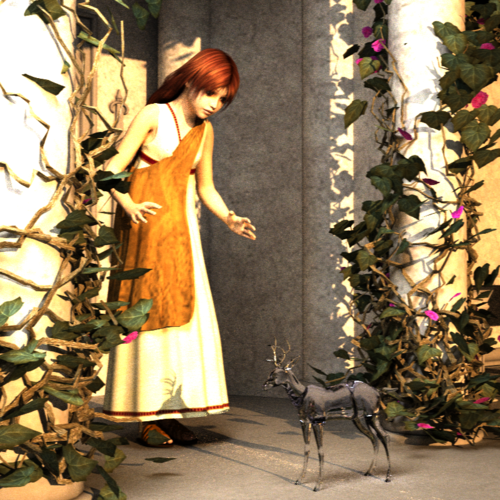 YT Julie wearing Wilmap's Greek Dress and Mitsu Hair for Genesis, discovering Sannzi's Glass Deer outside of the recently-released Atrium set. I initiated the render through the normal Render pane and it rendered in a normal render window, though you could probably do it in the Luxrender GUI if you wanted. Materials: I got rid of all the Glass Deer's maps, changed the diffuse color to white, and applied the Blue Glass2 preset. No other changes. 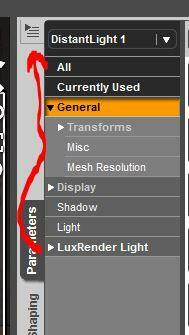 Luxus Settings: All I checked was "Collect Textures" which I always do with Lux. Other than that, it's all out-of-the-box default settings. Render Time: 30 minutes with approximately 60 samples per pixel. I am still trying to learn to use Reality 2.5 with no luck :( So how easy was it for you to use this new plugin? My concern is Reality's ASCEL. by rendering one scene I can do a complimentary scene with exactly the same settings. Will this program have that option? Will I also be able to share my settings over multiple computers or gain settings from someone else that has used or as the case may be, perfected a look, like wood, water, plaster, leather, or even skin with SSS? I'm currently working on a Star Trek Mirror Univers graphic novel and use this feature ALL the time. Also what shaders are included, the sales page is quite ambigious. These images are from using Reality to Lux...note the uniforms and plants are all the same in look. and the settings were automattically set and loaded upon export from D|S to lux. I have used Reality for some time now, and just bought Luxus. One thing to keep in mind when 'comparing' results...When Reality came out, I can remember the renders people posting were no where near as good as what gets posted today. Why? Because we were all still learning how to make it work. Luxus seems to have quite a bit of flexibility and it's integration with DS surface tab, (which I know well) really appeals to me. My results are not immediately up there with my Reality renders.....At this time! I do not have the experience and knowledge of Luxus, at this moment, that I do with Reality. Therefore, I can't really compare the two accurately. To say Luxus is or isn't as good isn't fair. I am getting better results with Luxus at this moment, than I did with Reality when I first started using it. Since both use LuxRender, I imagine as I learn more, my results will improve and come up to par with what I have learned to get out of Reality. :) I look forward to playing and learning Luxus. I do love what they have done so far. I look forward to see what they do with it in the future. Out of box it is quite easy if you follow the manual but I can't say yet much on quality because I didn't try yet to use ubersurfaces and pwShaders with it. 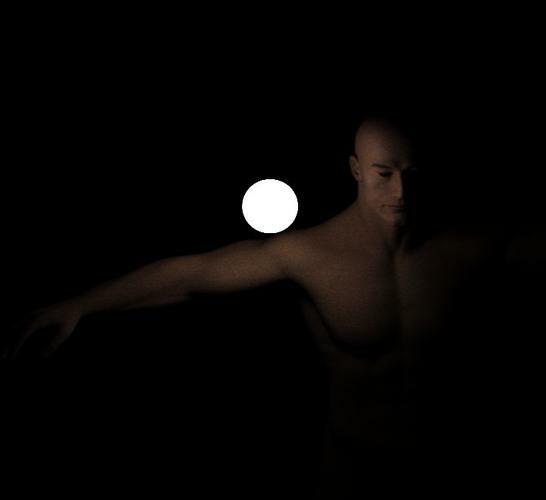 This is a very quick and dirty (2 minutes, no adjustments) render in Luxus, I tested light emitting materials. Seems to work. Luxus takes the approach that the LuxRender settings can exist with the art. 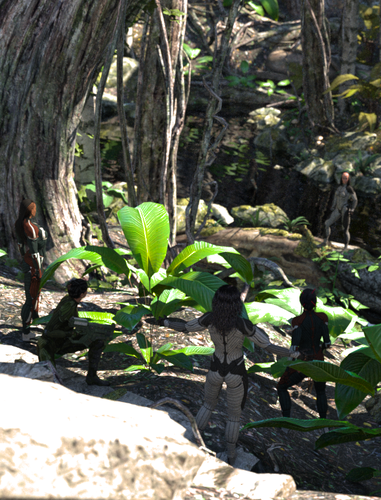 Artists can setup LuxRender setttings as part of the material settings in DAZ Studio. Anyone can create their own shader or material presets. I've just installed Luxus and am looking for the lights. Reading the manual, I'm getting the idea that I should use usual DAZ Studio lights which will be translated by Luxus - am I reading this right? If so, could I also use the Reality mesh lights, etc. and what would be the effect? I'll try out a few things in the meantime. 1. 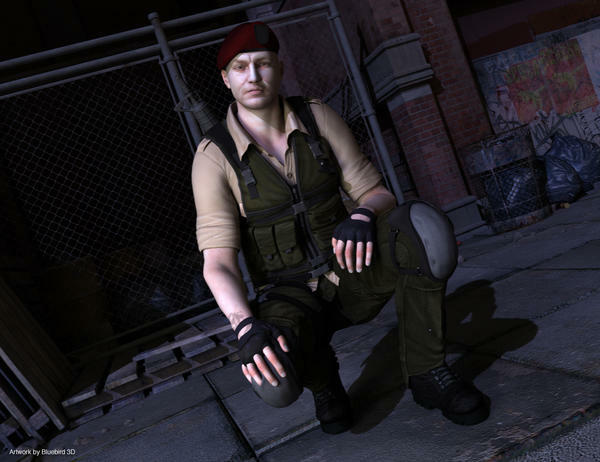 Create a distant light in DAZ Studio. Menu → Create → New Distant Light. 2. Ensure your light is selected in the Scene Pane(Tab). 3. Add LuxRender settings. 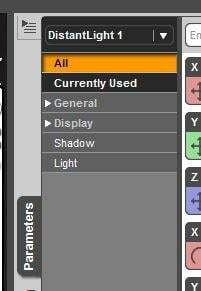 Parameters Pane → Options Menu → “Luxus – LuxRender Light”. 4. You will see a dialog asking you to select an option. Choose “sun sky2”. 5. Rotate the light so that is a more downward facing direction, ex: X Rotate of -33 degrees. 6. Note the “LuxRender Light” and its child parameters added to the Parameters Pane. 7. You can now position the light and adjust its Light parameters to suite your needs in 3Delight and in LuxRender..
Luxus takes the approach that the LuxRender settings can exist with the art. Artists can setup LuxRender settings as part of the material settings in DAZ Studio. Anyone can create their own shader or material presets. I'm guessing you're answering my question about ASCEL. So is this based on experience with the program. Reason I ask is LUX looks at the textures and setting entirely differently than DAZ does. In my case I've had up to 9 people plus stonemason's jungle sets in a single image and each person and plant has distinct settings that are unique to that character or prop. I don't want DAZ/Luxus just lumping those settings into a single setting. ie Water is probably the most difficult thing to simulate in D|S but a cake walk in Lux. Wood finish looks okay in D|S but when you add a version of SSS to it in LUX, you can have a hard wood look with a polish on top. and then a few weeks later load the same set from scratch and ASCEL will auto load those settings or what ever settings you've asked or set up previously. Sorry, I don't see that menu in my Parameters Tab. So is this based on experience with the program. Um...looks like he is the PA who did it actually. SphericLabs, one question...does this export a scene file that can be started from the Lux GUI/console or does it just call the Lux engine and start rendering in DS? The reason I ask...I run under WINE and the native Linux Lux is much faster than than running the Windows version under WINE. What version of Lux is it compatible with? Basically what feature set does it support? Is it current with the latest release build? - Luxus translates Studio materials well but you still have to tweak some settings. This is due to the differences between the way biased and unbiased render engines work. The easiest example I can share is having to change the default diffuse color to anything but pure white (IE: 255, 255, 255) in the Studio surfaces tab. Since a lot of PA, myself included, do not bother changing this default color when we are using a texture, there are a lot of adjustments to be made here. It only takes a couple of minutes, depending on the complexity of your scene. - Luxus exposes all of the native material options available in LuxRender. If you do not want to use the Studio settings, you can just choose one of them instead and it will override the Studio material for Lux. - Luxus defaults to a decent set of render parameters right out of the box which means that provided you have a decent lighting rig, you can expect to see predictable results. However, if you do not have a decent lighting rig, there is nothing this plugin can do for you to fix that. There is no getting around good lighting. I am making a video tutorial series to help out with all of these questions. I expect to have it wrapped up and shipped to Daz by Friday and from there it is up to them when it will be released. .... On a personal side…. I love this plugin. It stays out of my way and lets me focus on what I want to do, which is to create fun renders. I don’t care about mathematical light scatter theory or detailed explanations of what different surface types mean to the physical laws of nature. I speak this language: Less shiny. More shiny. Okay that’s pretty…. Luxus allows me to think the way I think and then it goes off in the background and stays quiet. I’ll leave you with some of my own renders in progress. These were done in LuxRender via the Luxus plugin. I totally get that concern. I ran into the exact same problem when I wanted to use one of Stone's set with this plugin and render it in Luxus. The direct answer is this is no problem at all. The Luxus plugin allows you to assign Lux materials to the existing surface settings in Studio -without touching- the 3Delight materials. It knows to use the Lux materials if you chose to assign one. Otherwise it will copy Studio's over. Now in the case where specialized shaders are being used specifically for 3Delight - yeah.. you're going to want to make your own surfaces for Lux renders but you will NOT lose your Studio settings as a result of that. The item will simply have both. The settings stay the same even after saving and closing the scene, too, so you don't have to redo anything from scratch when you want to go back to it. For me, it was a piece of cake. Just create the scene, open the Render window, and select Luxus as the render engine. Then hit Render, just as you would with 3Delight. Before you do that, however, you need to download and install Luxrender, which you probably already have. Everything happens in the regular render window, and another window gives you a stream of updates as it cooks. A button on this other window lets you stop the render when it looks good enough. Then just save the picture to the Render Library, just as you would with a regular render. I've been holding out for Reality 3 for D|S, so I can't compare Luxus with Reailty. Reality 3 will apparently have tons of previews and SSS and online databases for downloading the right material settings for everything. These advanced capabilities won't come for free, of course, and this accounts for the price difference. You may want to stick with Reality 2.5 for now. But for me, I don't mind giving up the power windows and leather seats and all the trimmings. Frankly, I was happy with LuxRenderDS when it was around. Luxus gives me the basics and at a good price. And it does it now, not nine months from now. Just thought I'd share that in case anyone else has the same problem. Off to play now! The content for Luxus (a few shader and light presets) will install through DIM, but the Plugin itself, needs to be downloaded via the traditional route. Please always run the lastest Luxrender with Luxus. It runs the LuxRender console executable by default, you can change it to render with the LuxRender Gui in the Render Settings Options. So I would recommend render with the gui, stop it, then fire up your linux one. Of ourse using Luxus will be easier then when starting with Reality since you have gained experience using Reality & Lux. I got decent results with Reality from the get go. I just got better with material adjustments and reducing render times. Question is there any area type ligting like the mesh lights ? Thats one thing I wayyy prefer over 3Dlight is much better control of lighting. im getting the hang of Luxus, the going is slow, my only problem is where in gods name is it saving the renders too. i've searched my mac for the file name listed on the top of the luxrender window and no luck. the one other question i do have is if i opt to not use the Luxrender GUI do i still have a way to manage the lights? 1. Does this utilize the GPU for rendering? There are some area light presets included with luxus. Or you can create your own. Create a plane, select the surface, do the Surfaces Option Menu, "Luxus - LuxRender Material", I could choose null as the type and click the Light Parameters, Accept. Then click in the surface pane and find the LuxRender Parameters(I like to type Lux in the search field) and turn on the LuxRender - Light Enable. You can also adjust the power there too. I think what you are asking is, Does LuxRender use the GPU? It can if you choose hybrid renderer. I am not a big fan of the GPU rendering because you only get one light group. Adjusting the light groups after the fact is very awesome. Although using the Sun Sky2, its the Daylight Light Preset provided with Luxus, should work fine with the hybrid renderer. 2) I am sure it can be made to work, and I will look into this, but I have not tested it.. In the DS Render Settings, I told it to save in a particular folder. :) You should be able to set your preferred location there. It saved the Image, lxs file as well as the support files. Great plugin, are there plans for a Carrara version? If not, how can we change your mind? Having just started using Lux, anyone know how well it handles Instancing?